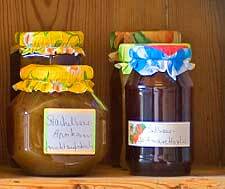 Making fruit preserves is not a difficult exercise and has the advantage that there is no need for extensive, expensive kitchen equipment. However, there are a few essentials that will make this process easier and more successful, resulting in a better end product with a lengthy shelf life. Special jam making thermometers are ideal for novices, since they will help guide you to the correct 'setting point' of the mixture - the 'magical' temperature of 104°C / 220°F. These thermometers are designed to clip onto the sides of the pan, so that the temperature can be regularly monitored. However, the steam and positioning, as well as splashes of the mixture, can often make it difficult to monitor the temperature in this way, and so the more experienced simply prefer to test their mixture by spooning a small amount onto a chilled plate, rather than using this piece of rather specialised jam making equipment. A large, heavy duty preserving saucepan will certainly prove to be a good investment if you are planning to take up jam making as a hobby. Size is important when it comes to pans, especially when you are dealing with large quantities. Of note, you should never put a lid on your jam making pan when making fruit preserves or chutneys, especially if you are trying to reduce the liquid content and concentrate the flavours. Glass jars certainly do come in all shapes and sizes, and prices. Perfectionists will most likely favour preserving jars with lids that come with rubber seals and are clipped into place by means of a lever arm, creating a perfect air-tight seal. 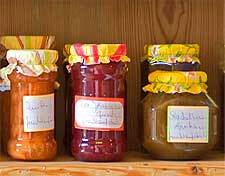 However, buying a dozen or so preserving jars can prove to be quite an outlay, and so with a little prior planning, it will prove far more cost effective to simply save up used glass jars yourself, perhaps asking friends and family for their spare jars as well. 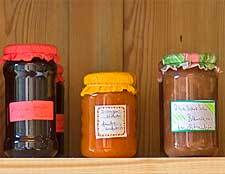 Before using jars and their lids, it is important that they are first sterilised. Wash them all thoroughly in warm and soapy water, rinsing well and drying with a clean towel. Just before you are going to pour the jam in, place the jars and their lids in a warm oven (120°C / 250°C) for no more than ten minutes. Alternatively, they can be boiled in a deep pan or washed in a hot dishwasher. Wax paper circles are widely available in all good kitchen shops (or online) and are an essential piece of equipment when you are planning a jam making session. These paper circles are used to create a long-lasting seal and prevent the arrival of mould, being placed on top of the jam shortly after it has been carefully poured into the jar. Be sure to place the disc with the wax side of the paper facing downwards. If you are unable to find pre-cut circles, you can always buy some wax paper from an art shop or stationers, and cut the discs out yourself, to the exact size that you require. This may actually be a preferable option if you are using different sized jam jars. A stainless steel jam funnel is certainly not an essential piece of equipment, but it will really make your life easier when you are ladling your jam into jars. These funnels have a wide base, so that even the thickest and chunkiest mixture won't get stuck, and some even have a convenient handle on the side.